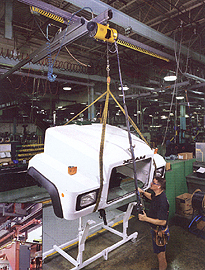 Rail systems, jib cranes, and air balancers help create ergonomic lifting and positioning systems that increase efficiency, reduce injuries, and increase safety. Bridge crane systems for every industry. This is a specific lineup of solutions. Many other types of balancer systems, controls, sizes, end effectors, and styles are available. Air balancers make heavy objects easy to move. Equipped with ZA controller pendent, allowing high-speed precision handling of variable weight loads. Select hook or trolley mounted balancers in capacities from 150 to 500 lbs. Manipulate & move heavy loads in tight spaces. Excellent for load transfers. Boom lengths from 4' to 20', with an overall height of 136" and underclearance of 96". Add an air balancer appropriate for your load for a powerful, versatile crane. Wall-mounted jib crane systems features a strong, smooth-rolling ZRS 3 steel boom in 4' to 20' lengths. Standard air supply equipped. Add balancers from 150 to 500 pounds capacity. Add workstations wherever building can support specifications of the crane. Place workstations along any wall or building column that can bear the weight and specifications of the crane. Features a strong, smooth-rolling ZRS 3 steel boom in 4' to 20' lengths. Standard air supply equipped. Add balancers from 150 to 500 lb. capacity. Floor supported rail systems provide the beam support for air-balancer bridge cranes so that workers at individual workstations have the lift assistance they need to avoid pain and injury moving heavy materials. Offered in three configurations: ceiling-mounted underhung parallel or perpendicular, and floor supported. Enclosed 24' long high-capacity, smooth-glide ZRS2 runway system with 10' wide ZRA1 enclosed aluminum bridge rail for air balancer mounting. End effectors provide versatility to handle a variety of loads, from sheets to cartons, bags and rolls. Proven solution for many common handling applications. Each device provides superior ergonomics. Standard balancers are equipped with hook ends. In the 1950's auto manufacturers developed a better way to maneuver a 2-ton vehicle: power steering. Suddenly, just about anyone could handle a huge vehicle -- tail fins and all. This newfound ease of use allowed people from many walks of life to utilize automobiles -- to do things that they'd never done before. And, removing the physical burden of steering a car made better drivers of everyone. Air Balancers can do the same thing for your operations. Balancer systems will revolutionize the way you handle heavy loads. It's almost like working without gravity. Loads can be raised, lowered, rotated, moved and handled with startling ease, allowing people to concentrate on the real task at hand, not the burden. With a system-based solution from Cisco-Eagle, you can improve processes and reduce the potential for injuries and other workplace disorders. Heavy tools, dies, parts and components become nearly weightless, allowing the user to focus on his job, not pushing, pulling, and straining with a heavy tool or part. Users can move and position things easily, regardless of physical strength.